James J. Tissot, "Jacob's Dream" (c. 1896-1902), gouache on board, Jewish Museum, New York. Every action we take, for good or for bad, has a reaction. The reaction to Jacob's deceit is enmity with his brother Esau. It doesn't matter that Jacob's sin led to a fulfillment of the will of God, there is still a reaction. Fortunately for Jacob, Isaac lives another 44 years or so. But Esau's sin of murder in his heart is yet another occasion to move Jacob into the center of God's will for him, to find him wives in Haran who will bear the 12 sons, whose descendants will constitute the 12 tribes of Israel. Strange, how God can work out his will through sin, in spite of sin! This is a mystery to us. Yet, here it is. Esau bears a grudge and because of this grudge begins to speak about his intentions to others. Note: first he says it to himself (27:41), but soon he is saying it to others (27:42). Out of the abundance of the heart, the mouth speaks. Rebekah overhears what Esau is plotting against her favorite son, and summons Jacob. "Flee at once," is her command. Is running from our enemies ever an answer? Sometimes. On a number of occasions when Jesus' enemies sought to arrest him or stone him, he just slipped away in the crowd (Luke 4:30; John 8:59; 10:39). Jesus had a mission to complete, and showdowns with his enemies did not suit this mission. Too often, our ego is so involved that we refuse to avoid conflicts which would distract us from our primary task. Jacob's primary task -- from God's perspective -- is to become a man of God and to raise a big family. He can do that better in Haran than he could with the Canaanite women in Palestine at the time. So Esau's threat becomes the impetus for change. Esau had married two wives from among the local heathen tribes populating Palestine at that time, the Hittites. "When Esau was forty years old, he married Judith daughter of Beeri the Hittite, and also Basemath daughter of Elon the Hittite. They were a source of grief to Isaac and Rebekah." (26:34-35). We aren't told the source of the conflict, but it is, no doubt, partly cultural. Rebekah has been raised in a nomadic tribe hundreds of miles away in Haran (Paddan Aram), north of the Euphrates River. The Hittites lived in houses and cities, and had different values. Probably Esau had brought his wives to live in the family encampment near Beersheba (26:23, 33). "We hate living in tents," they may have complained. "Things used to be better in our home cities." Complain, complain, complain. Major in-law conflicts result from this cross-cultural marriage. Not that Rebekah's family have been faithful followers of Yahweh, the God of Abraham. They possess household idols and are probably moon worshippers (31:19; Joshua 24:2, 15; see the Introduction). Apparently God preferred converting people from this distortion of true worship, than from the distortions practiced by the Canaan�ites. If the Israelites' religion were too close to that of the tribes of Canaan, the Israelites would be more tempted than ever to assimilate heathen practices into their worship. Esau has two wives. Eventually, Jacob acquires two wives and two concubines. Today Muslims allow up to four wives, if the husband is wealthy enough to support them. In the ancient Near East, having a number of wives was considered a mark of wealth and power. David had six wives, plus a number of concubines. Solomon had more than 1,000 wives and concubines (and he was considered wise!). But these multiple-wife households were full of problems of jealousy and favoritism, as we will see as our story unfolds. The Bible doesn't seek to justify polygamy, only report it. Monogamy is God's ideal, the righteous standard. But perhaps due to the hardness of men's hearts (Matthew 19:8), God allowed polygamy for a time. Certainly by the mid-first century AD, the Christian standard was "the husband of but one wife" (1 Timothy 3:2; Titus 1:6). This is still an issue in Africa, where, in many cultures, polygamy has been practiced for many generations. Typically, by the second generation of Christians in a believing family, polygamy is no longer practiced. Now, Jacob can flee Esau with an excuse and with his father's blessing. Esau, too, hears of his father's wishes regarding a non-Hittite wife for Jacob, so Esau finds a descendent of Abraham -- Mahalath, Ishmael's daughter -- and marries her as a third wife, in order to try to please his father (28:6-9). World -- the nations of the world will be blessed. This series of blessings introduces concepts that anchor themselves in Genesis and carry on throughout the Bible: covenant -- blessings and cursings, oaths and promises. We'll examine these more fully in Lesson 7. Paul's argument is that Jesus is the Seed of Abraham, and if we belong to Jesus, then we, too, are descendants and heirs of Abraham. So what of Abraham's promise is left for us to inherit? Land. Christ will reign on earth from Jerusalem, we are told. Descendants. For us, probably spiritual descendents are most prominent. World. Abraham's spiritual descendents are the salt of the earth who bring the message of Abraham's Seed -- the Messiah -- to the world. We are to be a blessing to the world. Through us, Christ's blessings are to flow out to others. Q1. (Genesis 28:3-4) Why does Isaac bless Jacob, especially after Jacob's deception? How does this blessing compare to other blessings of Abraham, Isaac, and Jacob? What are the main elements of Isaac's blessing? 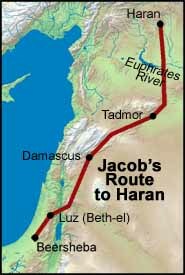 Jacob leaves Isaac's tent in Beersheba, a desert town in the extreme south of Palestine, and heads north to his uncle's home, hundreds of miles away around the Fertile Crescent. He stops, perhaps the second or third night, at a town called Luz (28:19). 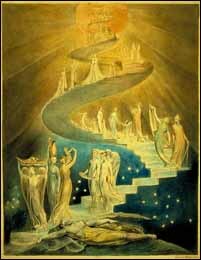 As he sleeps, he sees a vision of "Jacob's Ladder," angels ascending and descending a ladder or stairway1 to heaven itself, with the base of it resting near him -- the "gateway" of heaven. Then, in the dream, God himself appears to Jacob and speaks. William Blake (1757-1827), "Jacob's Ladder" (1800), watercolor, 37 x 29 cm, British Museum. "13b I am the LORD, the God of your father Abraham and the God of Isaac. I will give you and your descendants the land on which you are lying. and you will spread out to the west and to the east, to the north and to the south. First, God identifies himself: "I am the LORD, the God of your father Abraham and the God of Isaac" (28:13b). As we've seen, these promises form the core of the promises made to Abraham, renewed to Isaac, and then passed on to Jacob. This doesn't mean that God will eventually leave him; it means that God will be with him to fulfill the promise. Jacob has received blessings from Isaac by deceit (27:27-29) and then by Isaac's own will (28:1-4). But now he receives a blessing directly from God which confirms to him, the third generation, God's promises to Abraham. Jacob will never be the same. Up until this time, we see little spiritual life in Jacob, but when he awakes from his dream, he is profoundly moved. Something in his life has fundamentally changed. His father's and grandfather's God has just now become his own. Whereas, once he took what he wanted for himself, now God becomes the One he lives for. This is Jacob's conversion. How many times in our lives we could say the same thing. We are intent upon our own plans and we are surprised by God. He makes himself known. We had no idea he was there. Jacob probably doesn't understand God's omnipresence, that God is everywhere. He lives in a society of local, tribal gods. He probably believes that God is in sacred places, such as where his father or grandfather have set up altars. And he has just begun to grasp the greatness and awesomeness of the Creator God who made the heavens and earth. But for now, his faith has just taken a big leap to see the Lord of Glory in this humble place. But Jacob sees more than just a "house" or dwelling in his sudden new vision of God. This place, with angels ascending and descending, is the "gate of heaven," the entrance7 to the majestic City of God. Jacob has had a mind-expanding glimpse of God's infinite greatness. Q2. (Genesis 28:12-15) What did Jacob's dream of the angels ascending and descending from heaven signify to Jacob? What did God's blessing mean to him? In what way was this a conversion experience for him? The dream suddenly awakens Jacob. I doubt that he sleeps much more that night. At first light, he takes action. He takes the stone at his head and sets it up as a pillar (maṣṣēb�), a stone standing upright, a commemorative stele, from nāṣab, "to stand upright." 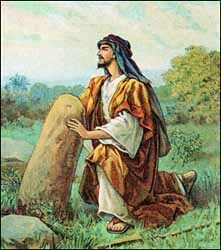 Jacob sets up a stone to the Lord, unknown illustrator. Hundreds of years later, after the tabernacle had been built and the people settled in Canaan, such pillars were not allowed (Deuteronomy 16:21). They were too easily confused with the heathen Baal worship which occurred on the high places, in contrast to the true worship of Yahweh. But in Jacob's time, the setting up of such a commemorative stele or pillar seemed an entirely appropriate way to honor and remember God's revelation of himself in this place.8 Prior to this time, his father Isaac had led the family in worship of Yahweh. But for the first time Jacob sets upright a stone of faith and remembrance before the Lord. It is his way of placing himself, his life, before the Lord. His father's God has become his own God now. After Jacob sets up the stone, he pours on top of it some of the precious oil he had taken with him for his journey. The practice of anointing seemed to be involved with cleansing and consecrating to God. Centuries later, kings, priests, and prophets were anointed for their offices. Objects in the tabernacle were anointed with specially-formulated anointing oil: altars, the tent of meeting, the ark, the laver and its stand, and all objects relating to the altar.9 When Samuel anoints David as king over Israel, the scripture records, "from that day on the Spirit of the LORD came upon David in power" (1 Samuel 16:13). The words "Messiah" (Hebrew māsh�aḥ) and Christ (Greek christos) both mean "Anointed One." Peter describes "how God anointed Jesus of Nazareth with the Holy Spirit and power...." (Acts 10:38). So Jacob sets up the stone as an act of dedication of himself in worship, a way of remembering God's presence in this place. He anoints it as an act of cleansing and consecration, setting it -- and himself -- apart for God. But Jacob's act of commitment to Yahweh is not over yet. It includes a vow. This may look like bargaining with God, but such was the format of a formal vow in Jacob's time. Each party would state his rights and obligations and formally make a vow to uphold the covenant. God has made promises to him in the dream; now Jacob formally responds. Yahweh has been his father's God, but now he vows that Yahweh (and Yahweh alone) will be his own God. What was family tradition now becomes personal. God's purpose for Jacob is focused in Canaan, the land that God had promised to Abraham and his descendents forever. However, the present journey is not just a sidebar to Jacob's life. Sometimes we feel like God may put us on a shelf, or that we're off on a siding, rather than on the main track. We must be patient as God works out his purposes in our lives. We can't always see God's purposes from our vantage point. We must trust him. He will "bring us back" safely to that place he has for us. Q3. (Genesis 28:18-21) What did it mean to Jacob to set up the stone? What did anointing the stone mean to him? Why does he do these things? What does he promise God in his vow? Why does Jacob promise to tithe, that is, give one tenth of all that God gives him? His grandfather Abraham had tithed to Melchizedek, king of (Jeru)salem and priest of the Most High God (14:18-20), so there is some family tradition. But what does tithing mean in this context? We see an interesting passage in 1 Samuel 8, where the Israelites demand that the aging prophet Samuel give them "a king to lead us, such as all the other nations have"
I believe that Jacob offering to tithe is his way of accepting the Lord's kingship over him, an act of submission and fealty. This would accord well with Israel's tithe after the tabernacle was built, as well. If you study it, you'll see that the tabernacle in the wilderness was built as a richly appointed portable palace for Israel's invisible king. The Holy of Holies was the throne room, where the Mercy Seat was over the Ark of the Covenant, the throne. The next room was the Holy Place where the Levitical Priests attended the King, burning incense on the golden Altar of Incense, keeping the Seven-Branched Lampstand lit, and bringing fresh loaves for the Table of Showbread. The courtyard which surrounded the Tabernacle formed a boundary of sacred ground in the very midst of Israel's camp. Tithes were collected from the people in order to support the Levites who served the God in the tabernacle or temple. Through the Prophet Malachi, God says that to withhold the tithe is to rob God (Malachi 3:8). The tithe was not just an offering to God, but his due. Jacob's faith is both that God will supply -- and that the resources are ultimately God's. His tithe is a recognition of that. I believe that tithing for the Christian represents something similar. We see ourselves as stewards of what actually belongs to God. And the tithe of our income is a way of demonstrating our allegiance, our love, and that we serve God rather than Money (Matthew 6:24). Ultimately, tithing isn't about money but about discipleship. Tithing is a powerful indicator to us that we trust God and have committed our lives to him. And so it was for Jacob. Q4. (Genesis 28:22) What does Jacob's promise to tithe indicate about his commitment? Presumably, Jacob has been a believer in Yahweh all his life. In what sense is this incident at Bethel a conversion experience for him? What is the relationship of tithing to conversion? At the beginning of our passage we see Jacob the manipulator fleeing from his brother. But before he gets very far, he meets God and his life is radically changed. He has heard about his father's God; now he meets him. He had heard of the blessings of Abraham; now he has them renewed to him by God himself. He has had a nebulous faith in his father's God; now he commits himself in allegiance and submission to God as his King and Lord. Jacob the Supplanter is converted. Lord God, thank you for your patient love that finds us and calls us to yourself. I pray that my conversion to serve you might be deep and lasting. I place myself before you as Jacob set up a stone in your sight. I offer my tithe to you as a way of saying that I place myself under you and give you my full allegiance and trust. I love you. In Jesus' name, I pray. Amen. 1. Sullām, "ladder." Patterson remarks, "Some would suggest the translation "stairway" and liken the structure to a ziggurat, which is possible. However, there are other words for stairway, and ladders were used at a very early time" (R.D. Patterson, Sullām, TWOT #1506c). However, Hamilton sees a connection (through metathesis) with the Akkadian simmiltu, "stairway" (Hamilton, Genesis, p. 239). 2. Pāraṣ, "break through," perhaps here, "spread," that is, "become known." (BDB 829, 10). 3. Shāmar, "keep, preserve, protect" (BDB 1036, 4). 4. Māq�m is a "mem preformative" noun from q�m, "stand," represents "the physical location where something is or ought to be, that is, its station. So, it is translated 'place, home, room'" (Leonard J. Coppes, q�m, TWOT #1999h). 6. Andrew Bowling, yārēʾ, TWOT #3372. 7. "Gate" is shaʿar, "gate." Two other words are sometimes translated "gate," petaḥ and delet. The former actually means 'entrance,' from the verb meaning 'to open.' The latter refers to the 'door leaves' making up part of the gate. Shaʿar refers to the whole gate complex and to the open area on either side of it. The shaʿar "gate" was, of course, the means of controlled access to a walled city. Depending on its size, a city had varying numbers of gates, but always one main gate which often consisted of an outer and an inner gate (Herman J. Austel, shʿr, TWOT #2437a). 8. Roland K. Harrison, "pillar," ISBE 3:869-871; Roland de Vaux, Ancient Israel 2:285-286; Uzi Avner, "Scared Stones in the Desert," Biblical Archaeology Review, May-June 2001..Such a stone is known by different names: pillar, standing stone, massebah, and stele. See also passages in Genesis 31:13, 45, 51f; 35:14,20; Exodus 23:24; 24:4; 34:13; Deuteronomy 7:5; 12:3; 16:22, etc. 9. Franz Hesse, chrio TDNT 9:496-509. 10. "A nēder is something promised to God verbally" (Leonard J. Coppes, nādar, TWOT #1308a). 11. The very common verb sh�b is used in both verses. The basic meaning of sh�b in the Qal stem (as in verse 21a) is "to (re)turn," implying physical motion or movement. The Hiphil stem (as in verse 15b) is causative, "bring back, carry back" (Victor P. Hamilton, sh�b, TWOT #2340). 12. Eugene E. Carpenter, "Tithe," ISBE 4:861-864.